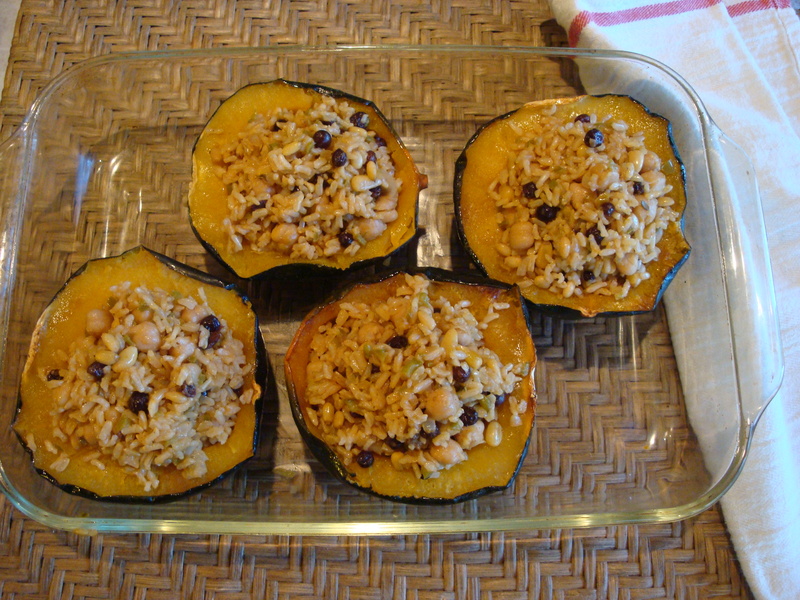 When fall rolls around and the markets are filled with winter squash, I can’t wait to make this dish. It’s an amalgamation of two recipes, one from Deborah Madison’s Vegetarian Cooking for Everyone (one of my very favorite cookbooks!) and one from Rodale’s Basic Natural Foods. 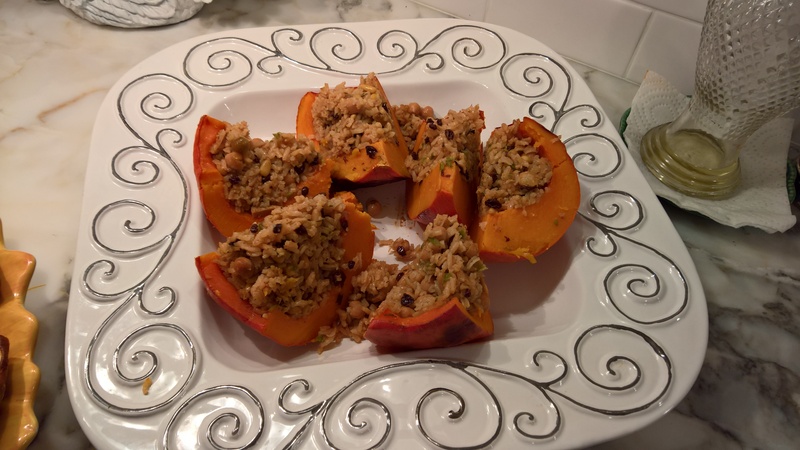 The aromatic rice is filled with goodies and flavor and melds perfectly with the creamy earthiness of the squash. This works really well as a vegetarian main dish or as a side to chicken or pork. The earthy creaminess of a Pinot Blanc white wine pairs beautifully. We make this dish every year since we first got the recipe from Aunt Suzy in our very first “dinner in a box” gift. It makes a really great dish for company, especially for us because many of our friends are vegetarian. We usually serve it as a main course with an elegant salad, or sometimes with a flavorful pureed soup. 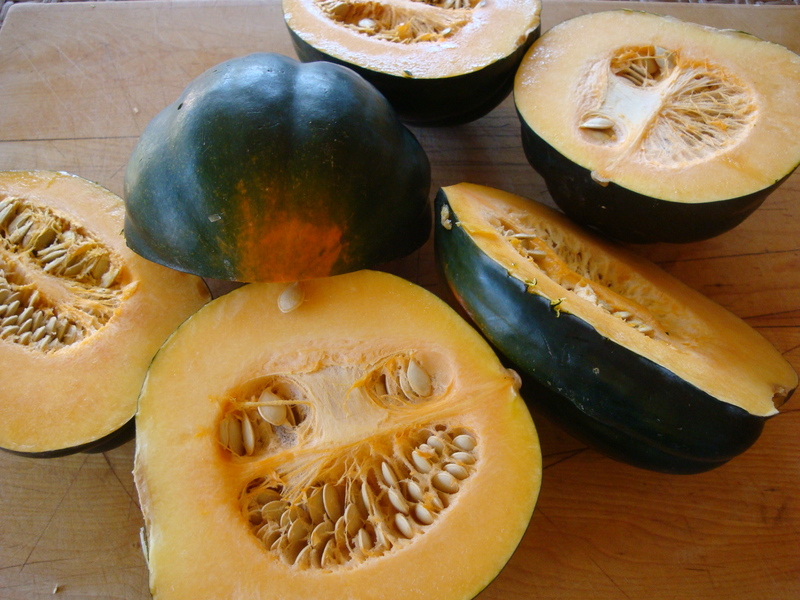 Cut squash lengthwise and scoop out seeds. 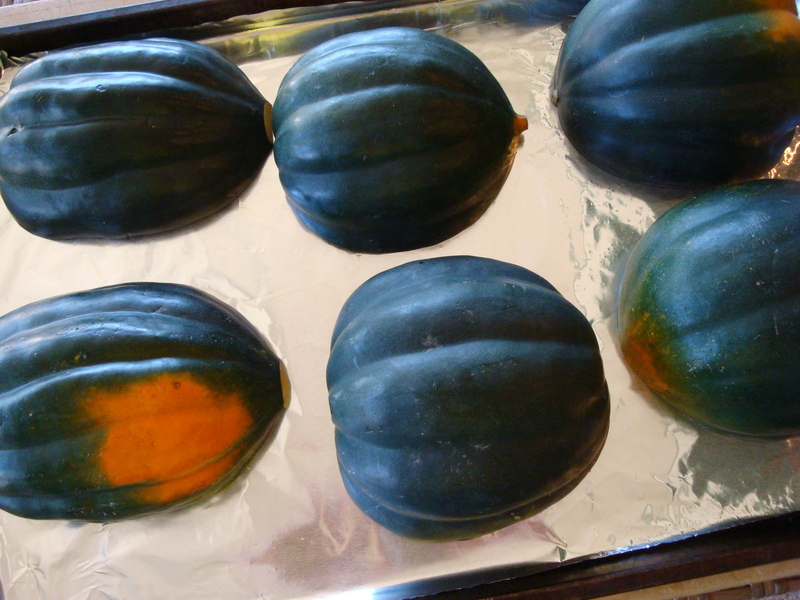 Lay cut side down in a foil-lined roasting pan or cookie sheet and bake 40 minutes at 375 degrees. 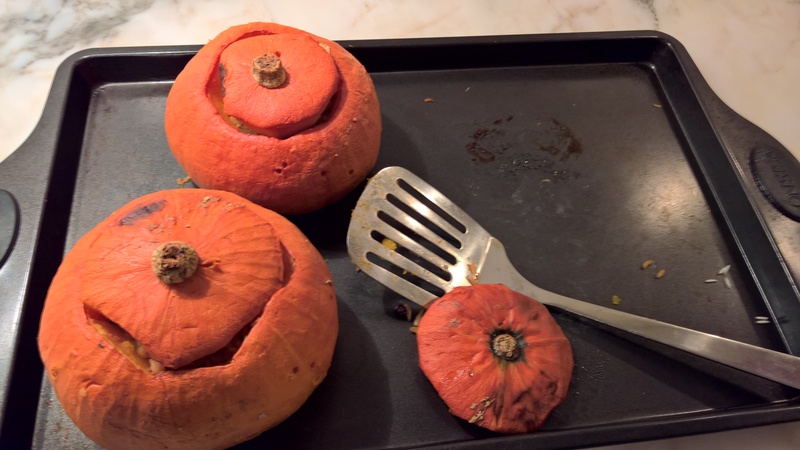 I find it’s helpful to loosen the squash with a spatula about half-way through the baking so that they don’t stick to the foil. 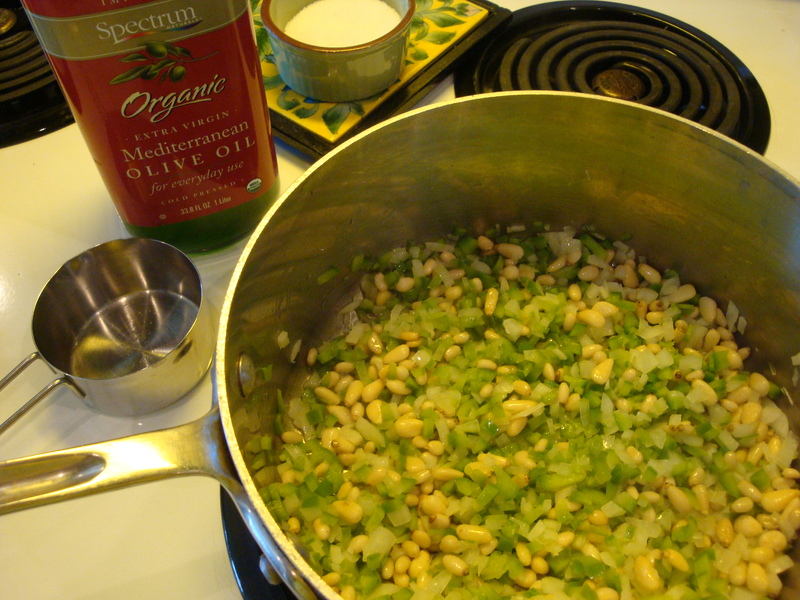 Sauté onions, green peppers and pine nuts in oil until soft, 5-8 minutes. 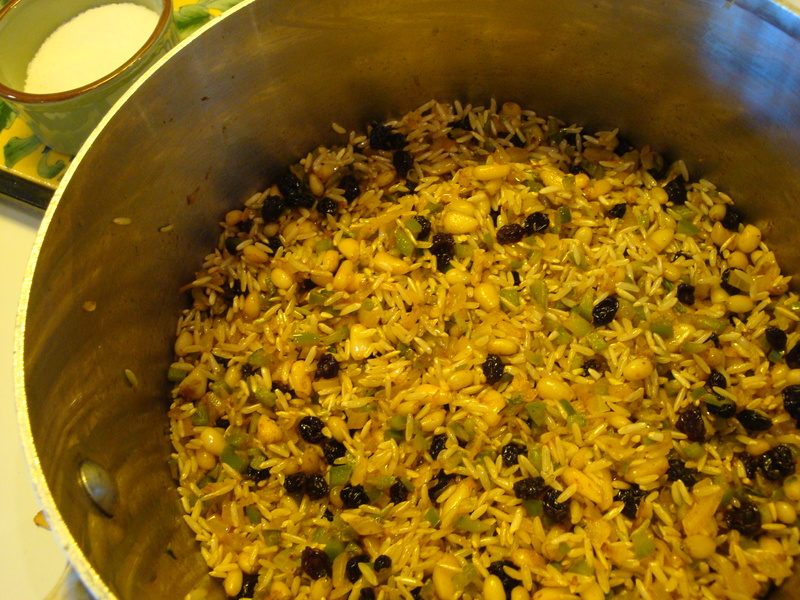 Add currants and all herbs/spices and sauté for 1 minute, then add the rice and saute for a few more minutes. Add water, lemon juice and salt. Cook, covered, till liquid is absorbed (20 min for white rice; 45 for brown). 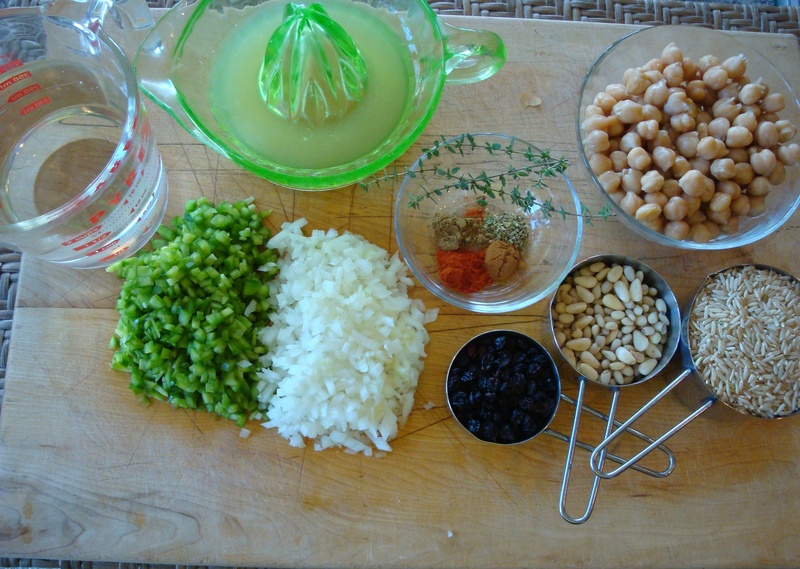 Let stand for 10 minutes, then fold in chick peas. Bake upright, uncovered, for 30 minutes at 350 degrees. 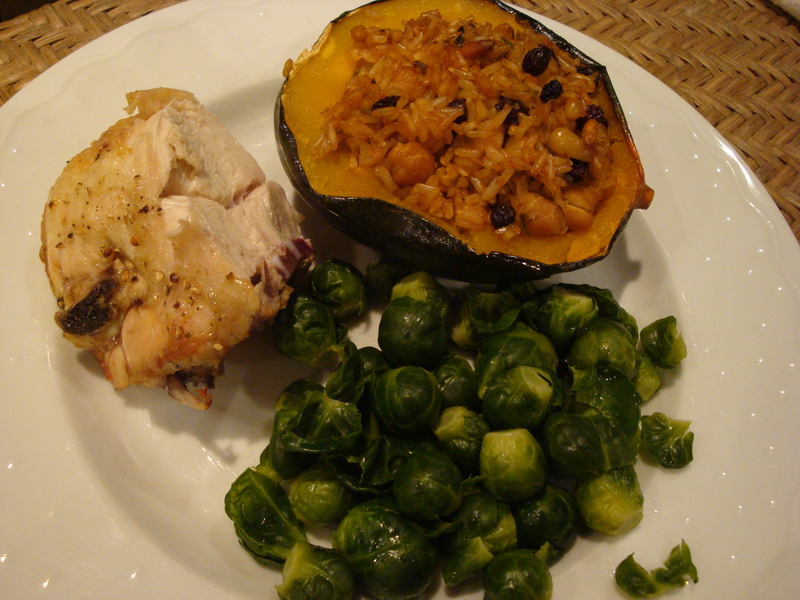 Here’s a pic of the finished meal – squash, baked chicken breast and the tiniest, cutest, most delicious brussel sprouts ever! COOKS’ NOTES: The rice ends up a little on the wet side which is important so that it doesn’t dry out in the final baking step. You can also serve this rice as a side dish without the squash. In this case maybe back off ¼ to ½ cup on the liquid. Steps 1 and 2 can be done up to 2 days ahead of time and refrigerated. 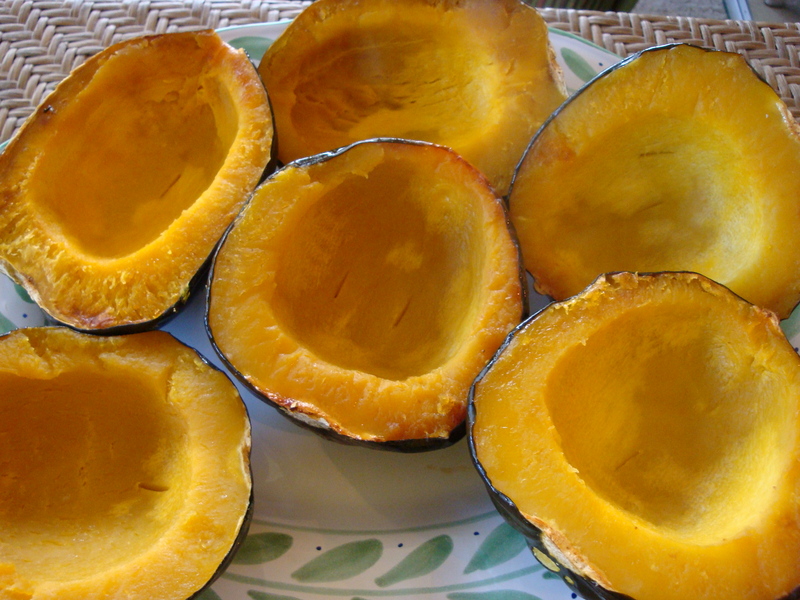 Let the squash and rice come to room temperature before finishing. Cut two red or green peppers in half lengthwise and take out seeds and ribs. 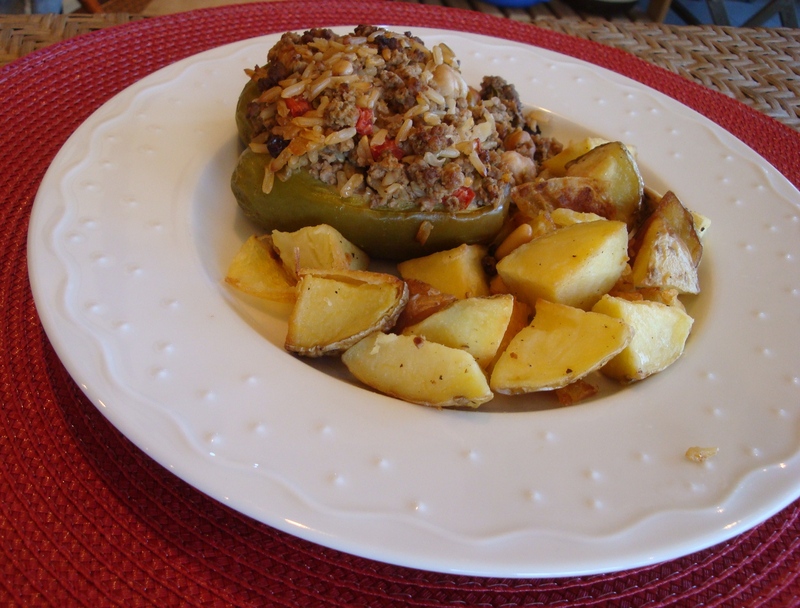 Mound the stuffing in the peppers and drizzle with olive oil. Bake uncovered for 25-30 minutes. Delicious with oven roasted potatoes and an herbal red Cotes du Rhone!